Lithia Spring Water LLC [LSW], the owners of this site are not licensed medical doctors. Neither are they nor other personnel of the Company may diagnose or treat medical ailments or diseases. Persons requiring medical attention should consult a licensed medical doctor. This web site is owned and operated by [LSW]. Unless otherwise specified, all Materials on this web site are the property of [LSW] and are protected by the copyright laws of United States Of America and, throughout the world by the applicable copyright laws. You may, view, print and/or download one copy of the Materials from this web site on any single computer solely for your personal, informational, non-commercial use, provided you keep intact all copyright and other proprietary notices. No Materials published by you on this web site, in whole or in part, may be copied, reproduced, modified, republished, uploaded, posted, transmitted, or distributed in any form or by any means without prior written permission from [LSW]. The use of any such Materials on any other web site or networked computer environment or for any other purpose is strictly prohibited and such unauthorized use may violate copyright, trademark and other similar laws. Except for any disclosure by you for customer support purposes, or as specified in our Privacy Statement, all communications from you to this web site will be considered non-confidential and non-proprietary. You agree that any and all comments, information, feedback and ideas regarding our company, products or services that you communicate to [LSW] ("Feedback") will be deemed, at the time of communication to [LSW], the property of [LSW], and [LSW] shall be entitled to full rights of ownership, including without limitation, unrestricted right to use or disclose such Feedback in any form, medium or technology now known or later developed, and for any purpose, commercial or otherwise, without compensation to you. You are solely responsible for the content of your communications and their legality under all laws and regulations. You agree not to use this web site to distribute, link to or solicit content that is defamatory, harassing, unlawful, libelous, harmful to minors, threatening, obscene, false, misleading, or infringing a third party intellectual or privacy rights. Access to and use of password protected or secured areas of this web site is restricted to authorized users only. You will be asked to provide accurate and current information on all registration forms on this web site. You are solely responsible for maintaining the confidentiality of any user name and password that you choose or is chosen by your web administrator on your behalf, to access this web site as well as any activity that occur under your user name/password. You will not misuse or share your user name or password, misrepresent your identity or your affiliation with an entity, impersonate any person or entity, or misstate the origin of any Materials you are exposed to through this web site. The linked sites are not under the control of [LSW] and [LSW] is not responsible for the content of any linked site or any link contained in a linked site. [LSW] reserves the right to terminate any link at any time. [LSW] may provide links from this web site to other sites as a convenience to you and in no way should this be interpreted as an endorsement of any company, content or products to which it links. If you decide to access any of the third party sites linked to this web site, you do this entirely at your own risk. [LSW]DISCLAIMS ANY AND ALL WARRANTIES, EXPRESS OR IMPLIED, TO ANY SUCH LINKED SITES, INCLUDING BUT NOT LIMITED TO ANY TERMS AS TO THE ACCURACY, OWNERSHIP, VALIDITY OR LEGALITY OF ANY CONTENT OF A LINKED SITE. You agree to indemnify, defend and hold [LSW]harmless from and against any and all third party claims, liabilities, damages, losses or expenses (including reasonable attorney's fees and costs) arising out of, based on or in connection with your access and/or use of this web site. IN NO EVENT SHALL [LSW] OR ITS SUPPLIERS BE LIABLE FOR ANY DIRECT, INDIRECT, SPECIAL, INCIDENTAL OR CONSEQUENTIAL DAMAGES INCLUDING, WITHOUT LIMITATION, LOSS PROFITS OR REVENUES, COSTS OF REPLACEMENT GOODS, LOSS OR DAMAGE TO DATA ARISING OUT OF THE USE OR INABILITY TO USE THIS WEB SITE OR ANY LINKED SITE, DAMAGES RESULTING FROM USE OF OR RELIANCE ON THE INFORMATION OR MATERIALS PRESENTED ON THIS WEB SITE, WHETHER BASED ON WARRANTY, CONTRACT, TORT OR ANY OTHER LEGAL THEORY EVEN IF [LSW] OR ITS SUPPLIERS HAVE BEEN ADVISED OF THE POSSIBILITY OF SUCH DAMAGES. We do not offer products or services for the purpose of diagnosis, prescription for, treatment of, or claims to prevent, mitigate or cure any disease, medical or psychological condition. The statements made on this web site have not been evaluated by the Food and Drug Administration or any other governmental authority, unless otherwise specifically noted. We do not discriminate on the basis of any unlawful categorization. We provide services and/or products privately, with recipient's informed consent only. The mineral spring water, discussed on this site may not have undergone evaluation and/or testing by the United States Food and Drug Administration or like agency of any other country. Risks that might be determined by such testing are unknown. 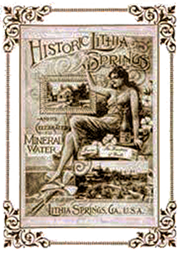 Lithia Spring Water is not intended to diagnose, treat, cure or prevent any disease. Since the information published on the web site is accessible to anyone throughout the world, the site does not give legal, nutritional or medical advice that may apply to any particular consumer. The opinions expressed on this site, and on sites to which it may link, are not necessarily the views of the sponsoring organization and are not adopted for commercial purposes. This information is not intended to diagnose or prescribe for medical or psychological conditions, nor does it claim to prevent, treat, mitigate or cure such conditions by standard medical means. We do not provide diagnosis, care, treatment or rehabilitation of individuals, nor apply medical, mental health or human development principles. If the products are of benefit to customers, such benefit is derived from their nutritive value and not any drug action claim. Insofar as the organization is a private association, this web site is "Expressive Association" which is the expression of the association's beliefs through its internal decisions and activities. If you purchase any services or products through the web site, you acknowledge that you have done so with informed consent and you hereby privately license the provider of the services or products to provide such products or services. You may return any product within a 15 day period, receipt of goods, for a full refund. All return products postage or shipping charges must be made by the buyer. All refunds will be honored and paid to the original buyer and no third party. Upon receipt of good (LSW) will have 15 days to make a full refund less postage charges. .
You may cancel your subscription at anytime. LSW provides a cancellation link on its website that you will have full access to. In the event that a subscription is canceled after a shipment has been made you will be charged, however you may return the product for a refund under the terms and conditions of [LSW] return policy. A link is provided on our website for cancellation of subscriptions. In addition, your emailed invoiced will have a link to the Subscription link. [LSW] assumes no responsibility for accuracy, correctness, timeliness, or content of the Materials provided on this web site. You should not assume that the Materials on this web site are continuously updated or otherwise contain current information. [LSW] is not responsible for supplying content or materials from the web site that have expired or have been removed. THE MATERIALS PROVIDED AT THIS WEB SITE ARE PROVIDED "AS IS" AND ANY WARRANTY (EXPRESS OR IMPLIED), CONDITION OR OTHER TERM OF ANY KIND, INCLUDING WITHOUT LIMITATION, ANY WARRANTY OF MERCHANTABILITY, FITNESS FOR A PARTICULAR PURPOSE, NON-INFRINGEMENT OR TITLE IS HEREBY EXCLUDED. Lithia Spring Water LLC operates the website, which provides the PRODUCTS and SERVICES. This page is used to inform website visitors regarding our policies with the collection, use, and disclosure of Personal Information if anyone decided to buy our product. For a better experience while using our website or buying our products, we may require you to provide us with certain personally identifiable information, including but not limited to your name, phone number, and postal address. The information that we collect will be used to contact or identify you. We want to inform you that whenever you visit our website, we may collect information that your browser sends to us that is called Log Data. This Log Data may include information such as your information such as your computer’s Internet Protocol (“IP”) address, browser version, pages of our Service that you visit, the time and date of your visit, the time spent on those pages, and other statistics. Our website uses these “cookies” to collection information and to improve our Service and Products. You have the option to either accept or refuse these cookies, and know when a cookie is being sent to your computer. If you choose to refuse our cookies, you may not be able to use some portions of our Service. When you access the Service by or through a mobile device (including but not limited to smart-phones or tablets), we may access, collect, monitor and/or remotely store one or more “device identifiers,” such as a universally unique identifier (“UUID”). Device identifiers are small data files or similar data structures stored on or associated with your mobile device, which uniquely identify your mobile device. A device identifier may be data stored in connection with the device hardware, data stored in connection with the device’s operating system or other software, or data sent to the device by Lithia Spring Water LLC. A device identifier may convey information to us about how you browse and use the Service. A device identifier may remain persistently on your device, to help you log in faster and enhance your navigation through the Service. Some features of the Service may not function properly if use or availability of device identifiers is impaired or disabled. Our Services and Products do not address anyone under the age of 13. We do not knowingly collect personal identifiable information from children under 13. In the case we discover that a child under 13 has provided us with personal information, we immediately delete this from our servers. If you are a parent or guardian and you are aware that your child has provided us with personal information, please contact us so that we will be able to do necessary actions.